This isn’t just another Prophet-5 virtual analog synth, though: Arturia says they’ll combine vintage emulation with digital vector synthesis for a matchup of old and new worlds. I’m a little too wrapped up in my TimewARP 2600 and a zillion other synths to get too hot and bothered over this for the moment, but I expect we’ll see more in a few weeks at NAMM. 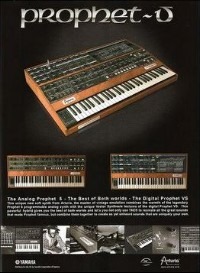 Arturia is unlikely to make an official announcement until then, but Matrixsynth has scanned the ad. Notice the Yamaha logo, since that firm picked up US distribution.